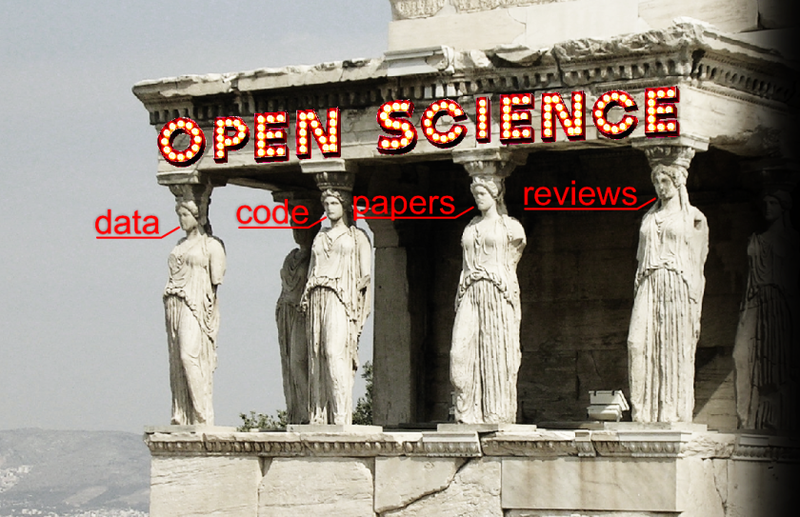 The four pillars of open science are open data, open code, open papers (open access), and open reviews (open evaluation). A practical guide to the first three of these is provided by Gorgolewski & Poldrack (PP2016). In this open review, I suggest a major revision in which the authors add treatment of the essential fourth pillar: open review. Image: The Porch of the Caryatids (Porch of the Maidens) of the ancient Greek temple Erechtheion on the north side of the Acropolis of Athens. Open science is a major buzz word. Is all the talk about it just hype? Or is there a substantial vision that has a chance of becoming a reality? Many of us feel that science can be made more efficient, more reliable, and more creative through a more open flow of information within the scientific community and beyond. The internet provides the technological basis for implementing open science. However, making real progress with this positive vision requires us to reinvent much of our culture and technology. We should not expect this to be easy or quick. It might take a decade or two. However, the arguments for openness are compelling and open science will prevail eventually.